Following the Linzergasse Alley, you will get to Linzergasse 41, the St. Sebastian Church with the attached St. Sebastian′s Cemetery (Sebastiansfriedhof). Here you will find the Mozart family tomb as well as the Mausoleum of Prince Archbishop Wolf Dietrich von Raitenau. 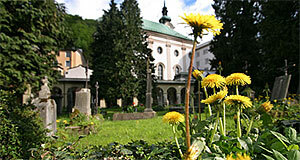 The nearby "Bruderhaus" and the "Bruderhof" served as a hospital and home for the aged from the 15th century onwards. The Sebastianskirche itself was built in 1512 after the Cathedral Cemetery was given up. The cemetery was older and initially created for poor people, people with leper and the victims of the plague, but gained new importance by this move. The Sebastianskirche is mostly Baroque in style, built by Kassian Singer from 1749 to 1753, although it bears some Rococo elements in the decorations. A fire in 1818 destroyed most of the original interiors, including the altar painting and frescos on the ceiling by Paul Troger. Apart from the main altar, there are three side altars in the Sebastianskirche. On the front façade of the church you will find a statue of St. Sebastian, made by Konrad Asper between 1614 and 1620. It was used as a decoration for the Linzertor gate until this part of Salzburg′s fortifications was dismantled in 1894 and later the St. Blasius Church. In the entrance passage to the cemetery you can see the grave of Theophrastus Bombastus of Hohenheim, called Paracelsus. He died in 1541 in an inn at the Kaigasse in Salzburg. Other celebrities on the cemetery include the father and the wife of Wolfgang Amadeus Mozart, Leopold and Constanze, as well as Prince Archbishop Wolf Dietrich von Raitenau, who was denied his spot in the crypt of the Dom by his successor and nemesis Prince Archbishop Markus Sittikus.